Three possible super-earths discovered around nearby sun-like star! Since it was launched in 2009, NASA’s Kepler mission has continued to make important exoplanet discoveries. Even after the failure of two reaction wheels, the space observatory has found new life in the form of its K2 mission. All told, this space observatory has detected 5,017 candidates and confirmed the existence of 2,494 exoplanets using the Transit Method during its past eight years in service. The most recent discovery was made by an international team of astronomers around Gliese 9827 (GJ 9827), a late K-type dwarf star located about 100 light-years from Earth. Using data provided by the K2mission, they detected the presence of three Super-Earths. This star system is the closest exoplanet-hosting star discovered by K2 to date, which makes these planets well-suited for follow-up studies. 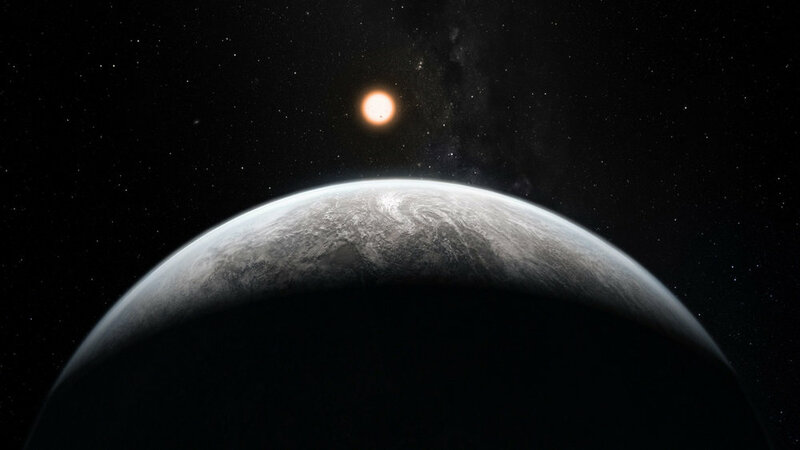 The study which describes their findings, titled “A System of Three Super Earths Transiting the Late K-Dwarf GJ 9827 at Thirty Parsecs“, was recently published online. Led by Dr. Jospeh E. Rodriguez from the Harvard-Smithsonian Center for Astrophysics (CfA), the team includes researchers from the University of Austin, the Massachusetts Institute of Technology (MIT), and the NASA Exoplanet Science Institute (NExSci) at Caltech. These questions were central to the team’s study, which relied on data obtained during Campaign 12 of the K2 mission – from December 2016 to March 2017. After consulting this data, the team noted the presence of three super-Earth sized planets orbiting in a very compact configuration. This system, as they note in their study, was independently and simultaneously discovered by another team from Wesleyan University. These three planetary objects, designated as GJ 9827 b, c, and d, are located at a distance of about 0.02, 0.04 and 0.06 AU from their host star (respectively). Owing to their sizes and radii, these planets are classified as “Super-Earths”, and have radii of 1.6, 1.2, and 2.1 times the radius of Earth. They are also located very close to their host star, completing orbits within 6.2 days. Specifically, GJ 9827 b measures 1.64 Earth radii, has a mass of up to 4.25 Earth masses, a 1.2 day orbital period, and a temperature of 1,119 K (846 °C; 1555 °F). Meanwhile, GJ 9827 c measures 1.29 Earth radii, has a mass of 2.62 Earth masses, an orbital period of 3.6 days, and a temperature of 774 K (500 °C; 934°F). Lastly, GJ 9827 d measures 2.08 Earth radii, has a mass of 5.3 Earth masses, a 6.2 day period, and a temperature of 648 K (375 °C; 707 °F). In short, all three planets are very hot, with temperatures that are hot as Venus and Mercury or (in the case of GJ 9827b) is even hotter! Interestingly, these radii and mass estimates place these planets within the transition boundary between terrestrial (i.e. rocky) planets and gas giants. In fact, the team found that GJ 9827 b and c fall in or close to the known gap in radius distribution for planets that are in between these two populations. In other words, these planets could be rocky or gaseous, and the team won’t know for sure until they can place more accurate constraints on their masses. What’s more, none of these planets are likely to be capable of supporting life, certainly not as we know it! So if you were hoping that this latest find would produce an Earth-analog or potentially habitable planet, you’re sadly mistaken. Nevertheless, the fact that these planets straddle the radius and mass boundary between terrestrial and gaseous planets – and the fact that this system is the closest planetary system to be identified by the K2 mission – makes the system well-situated for studies designed to probe the interior structure and atmosphere of exoplanets. “Recently, we have found planets around other stars that have no analogue to a planet in our own system. These are known as “super Earths” and they have radii of 1-3 times the radius of the Earth. To add to the complexity of these planets, their is a clear dichotomy in their composition within this radius range. The larger super Earths (>1.6 x radius of the Earth) appear to be less dense, consistent with a puffy Hydrogen/Helium atmosphere. However, the smaller super Earths are more dense, consistent with an Earth-like composition (rock). Looking ahead, the team hopes to conduct further studies to determine the masses of these planets more precisely. From this, they will be able to place better constraints on their compositions and determine if they are Super-Earths, mini gas giants, or some of each. Beyond that, they are to conduct more detailed studies of this system with next-generation instruments like the James Webb Space Telescope (JWST), which is scheduled to launch in 2018. Now that we have thousands of extra-solar planet discoveries under our belt, its only natural that research would be shifting towards trying to understand these planets better. In the coming years and decades, we are likely to learn volumes about the respective structures, compositions, atmospheres, and surface features of many distant worlds. One can only imagine what kind of things these studies will turn up! 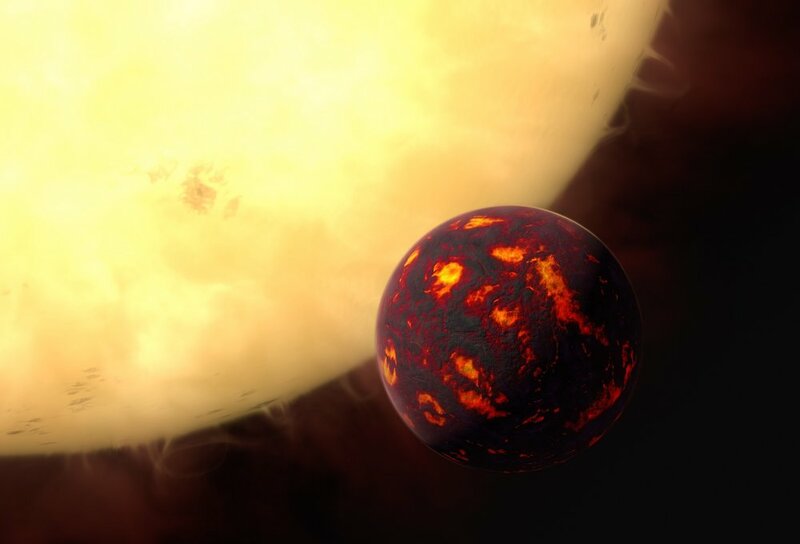 Newer PostInferno World with Titanium Skies - ESO’s VLT makes first detection of titanium oxide in an exoplanet!